OK, I admit it, I was somewhat surprised when Thomas Flinn & Co took over ownership of Clifton last month and immediately replaced the classic British racing green colour with graphite grey. 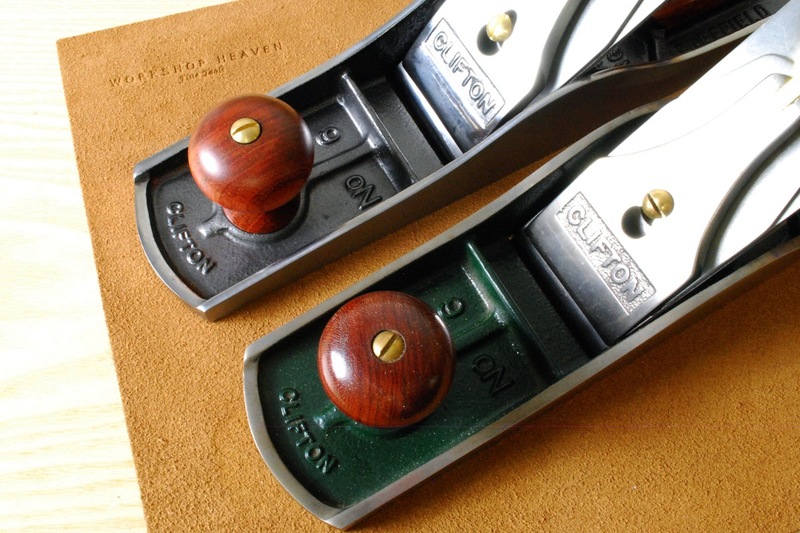 From a future historians perspective it will certainly provide a clear demarcation of which planes were made on whose watch, but surely, Clifton without green.....? 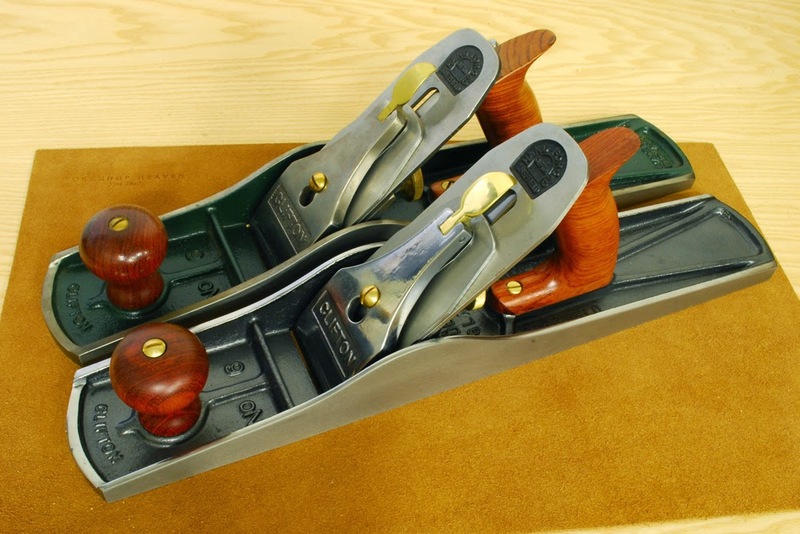 I have had a long affinity with Clifton planes, they were one of the first brands that we stocked and I have visited the factory and chatted with the guys that make them, written magazine articles about their manufacturing methods and so on. I also have a long standing relationship with Thomas Flinn & Co, who manufacture our Pax saws and (coming soon) Dorchester saws. 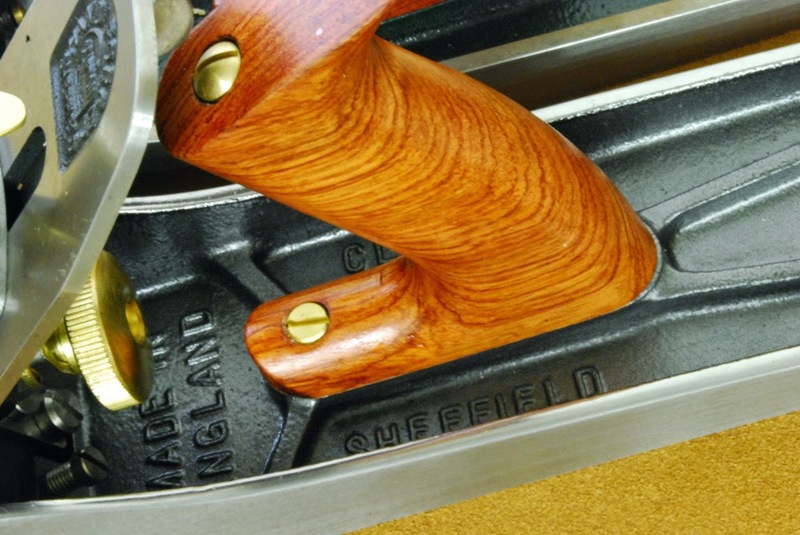 They too are a highly professional outfit with an unquestionable passion for Sheffield toolmaking, so I made the decision to reserve judgment until I had the opportunity to physically hold the product in my own hands. That day has come, so it's time to put my beloved original 2001 No.6 alongside its 2014 descendant and draw some conclusions. The first thing I noticed was that the lettering is much more visible on the new lighter colour, the surface is considerably smoother and it is clear that they have taken expert advice and invested in a premium quality finish. But what of the colour choice itself? For me the green was reminiscent of 1920's vintage Bentleys, soaring around the banks of brooklands with a screaming supercharger hanging out at the front, good old British engineering giving all comers a proper thrashing! The graphite strips all of that away, it is utilitarian, industrial, almost naked, really beautifully done but devoid of any emotional message at all. 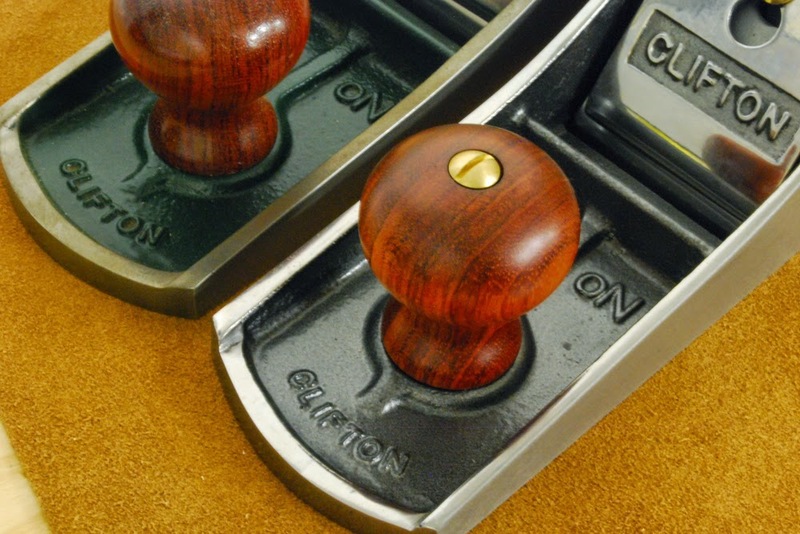 At the same time though, that very nakedness forces you to look beyond distractions like colour schemes or suggestive marketing and appreciate the tool for what it actually is - modern British engineering - still giving all comers a proper thrashing! Personally, I'm a convert, and my enthusiasm for the new colour scheme is growing by the minute, the graphite colour brings the product range up to date but in a subtle, refined way that accentuates their world renowned quality. The first Graphite Cliffies are now on sale, the remaining green ones are available at specially discounted prices in order to help us achieve a nice efficient switchover. As soon as we have a complete set of graphite ones we will update the listings with new photographs, pricing etc, but in the meantime please assume that non-discounted ones will be supplied in graphite. Maybe they will bring out a York pitch for my No4? I believe the old owners were of the opinion that a spare iron with a small back bevel was a faster, easier and cheaper way for the user to access the benefits of working at steeper pitches. Whether the new owners will see things differently, only time will tell.